Dererk Pardon prepares for flight. He did not miss a shot in the first half. It wasn’t as impressive a performance as Northwestern’s close December losses to Indiana and Michigan, but at least the Wildcats won this one in the clutch. 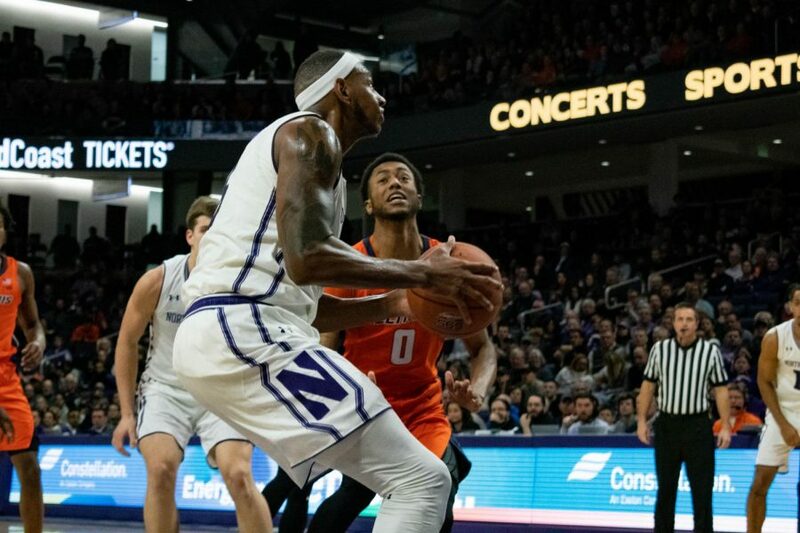 NU (11-7, 2-5 Big Ten) narrowly defeated Rutgers (8-9, 1-6) at the RAC as senior center Dererk Pardon muscled the team to a 65-57 victory to end a two game losing streak. Graduate guard Ryan Taylor added two threes in the last few minutes to put the Scarlet Knights away, preventing the Cats from a long road trip home. Guard Montez Mathis led Rutgers with 16 points, but a series of contested long twos from guard Geo Baker– who shot 4-14 from the field– led to NU pulling away late. 1. Cats goes down low. NU didn’t score more than 63 points in either of its last two games, so Collins made a move that at the surface wouldn’t help– putting junior center Barret Benson in the starting lineup alongside Pardon. But NU’s leading rebounder still had one of his most productive games of the season as Collins ran the offense through the post player. The Cats were in the bonus for the last 13 minutes of regulation, leading the Cats to put an even higher priority on slowing the game down and feeding the post. Pardon finished with 17 points and seven rebounds, and he was 6-6 from the field in the first half against a defense that puts protecting the rim as a higher priority than anything else. Benson added 4 points and five rebounds, and as the duo anchored the defense they held Rutgers to less than 40 percent shooting from the field. 2. Law is back but not himself. After missing NU’s last game against Michigan five days ago, senior forward Vic Law returned to action with a fresh haircut for a team that was missing its leading scorer. But at halftime he had as many points as fouls. The senior finished with 6 points despite the Scarlet Knights not having an ideal wing to match up with him. But he made a major basket attacking the rim late in the game and dove for a loose ball with 2:47 to go to give the team the ball up four points. With the offense running through Pardon and featuring graduate guard Ryan Taylor and junior guard A.J. Turner as secondary options, Law was a bystander for a team that continued to struggle from the field and wasn’t producing like in had in November. 3. The bottom of the Big Ten is a lonely place. NU entered Piscataway with the chance to lose its 7th consecutive conference game against a team with the lowest reputation in the conference. With the win, the Cats prevented themselves from slipping all the way down to 13th in the conference. NU plays No. 25 Indiana at home Tuesday, a team led by all Big Ten candidate Romeo Langford, but after a close game against Rutgers no one is arguing this team has figured it out as it moves forward in conference play.